Presented in the West as the realization of a friendly utopia, the brand new « Rojava » is in reality a colonial state, designed and cemented in blood by Washington. This time, the plan is to expel the populations of the North of Syria and replace them with people who were not born there. In order to implement this ethnic cleansing, the Pentagon and the CIA have mobilised combatants from the circles of the European extreme-left. Thierry Meyssan reveals this insane project which has been ongoing for the last eighteen months. 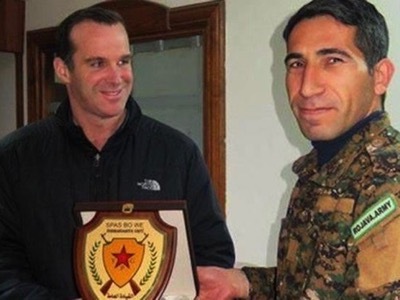 In February 2016, the White House « anti-terrorist Tsar », Brett McGurk, was sent by President Obama to supervise the battle of Aïn al-Arab (Kobane). On this occasion, he was decorated by the YPG (People’s Protection Units), whose head office – the Turkish PKK – is nonetheless considered by Washington to be a « terrorist organisation ». In the ’80’s and ’90’s, Kurdish society was extremely feudal and patriarchal. It was maintained in a severe state of under-development, which pressured the Kurds to rise up against the military dictatorships which succeeded one another in Ankara . The Kurdistan Workers’ Party or PKK was a Marxist-Leninist organisation, supported by the Soviet Union, which fought against the dictatorships of the Kemalist generals, who were members of NATO. 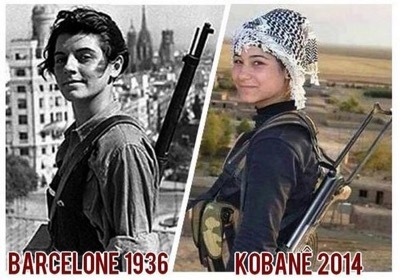 It freed women and joined progressist combats. With the aid of Hafez el-Assad, it set up a military training camp in the Lebanese plain of Bekaa, under the protection of the Syrian Peace Force, close to the camp of the Popular Front for the Liberation of Palestine (FPLP). During this period, the PKK could not find words strong enough to denounce « American imperialism ». When the USSR collapsed, the PKK had more than 10,000 full-time soldiers and more than 75,000 reservists. This war of liberation destroyed more than 3,000 villages and displaced more than 2 million people. Despite their immense sacrifice, it failed. Arrested in Kenya in 1999, during a joint operation with the Turkish, US and Israëli secret services, the historic leader of the revolt, Abdullah Öcalan, was imprisoned on the island of İmrali in the Sea of Marmara. The PKK collapsed, divided between its imprisoned chief, favourable to peace negotiations, and its lieutenants, for whom war had become a way of life. There were a few more terrorist attacks but it was not clear which were due to combatants who refused to disarm, or to a fraction of the gendarmerie, the JITEM, (Gendarmerie Intelligence and Counter-Terrorism) which also refused the cease-fire. At the beginning of the « Arab Spring », from his cell, Abdullah Öcalan rebuilt the PKK around a new ideology. After secret negotiations with NATO in the İmrali prison, he abandoned Marxist-Leninism for « libertarian municipalism ». This man, who had always struggled against Turkey in order to build his own state, Kurdistan, now believed that any state is in itself a tool of oppression . The militants of the PKK, who had been forced to flee Turkey during the civil war, had found refuge in the North of Syria . In the name of his followers, Öcalan had pledged in writing that he would never lay a claim to Syrian territory. In 2011, at the beginning of the Western war against Syria, the Kurds formed militias to defend the country which had given them shelter and awarded them Syrian nationality. However, on 31 October 2014, Salih Muslim – one of the co-presidents of the YPG, the Syrian branch of the PKK, took part in a secret meeting at the Elysées Palace with French President François Hollande and his Turkish opposite number, Recep Tayyip Erdoğan. There he was promised that he would become the head of state if he agreed to re-create Kurdistan… in Syria. Since so far there had been no military engagement by the YPG against Daesh, the United States stage-managed a terrible confrontation at Aïn al-Arab, rebaptised for the occasion with the Kurmanji name of Kobane. The international Press was invited to cover the event without risk. The town of Kobane is situated on the Syro-Turkish border, and the journalists were able to follow the combats from Turkey – with binoculars. We don’t really know what happened at Aïn al-Arab, since the Press was not allowed to enter the town. However, we are in possession of images filmed with tele-photo lenses, and they seem clearly to confirm the stories telling of the brutality of the combats. In any case, the West unanimously concluded that the Kurds were the allies they needed to fight Daesh and Syria. 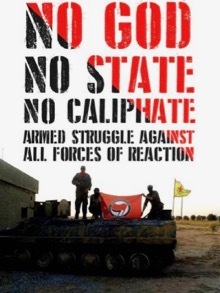 « No God, no state ! ». « Come and defend the state of « Rojava » and fight against all forces of reaction » – alongside the American Empire. The Western Press assures us that half of the Kurdish soldiers are women, as are, by statute, half of the leaders of the PKK/YPG. However, on the ground, their presence is rare. Journalistes also affirm that they terrify the jihadists, for whom dying at the hand of a woman is a curse which would forbid them access to paradise. Curiously, the same Press seems to ignore that the Syrian Arab Army also includes female battalions which the jihadists attack with the same rage as their male counterparts. Despite appearances, the YPG are not as numerous as they claim. Many Syrian Kurds consider the United States as an enemy power, and Syria as their new homeland. They refuse to adhere to the fantasies of Salih Muslim. So the Pentagon has added to the number of « their » Kurds, not only a few Arab and Assyrian mercenaries, but above all, militants from the European extreme-left. Just as the CIA has enrolled tens of thousands of young Western Muslims in order to turn them into Islamists, in the same way, it has recruited European anarchists to create the International Brigades, on the model of those which fought in 1936 in Barcelona against the fascists. We can also find auxiliary YPG/NATO troops such as the Internationalist Antifascist Batallion (Central Europe), the Bob Crow Brigade (English and Irish), the Henri Krasucki Brigade (French), the International Revolutionary People’s Guerrilla Forces (Americas), the Revolutionary Union for Internationalist Solidarity (Greek), the Unity of the Marxist-Leninist Party (Spanish), and all the pro-US Turkish groupuscules (DK, DKP, MLSPB-DC, PDKÖ, SI, TDP, TKEP/L, TKPML) to mention only the most visible . 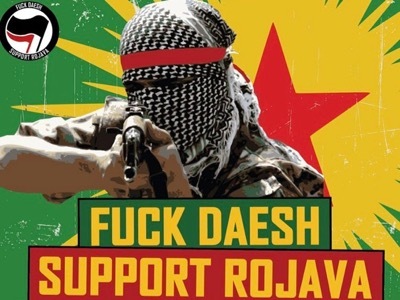 Come and fight against Capitalism, with the US Special Forces, in « Rojava » ! The battle of Aïn al-Arab, which was supposed to set the young Syrians favourable to the Caliphate against young Kurds, cost the lives, on both sides, of young Europeans in search of a better world. The European countries worry about the possible return of young jihadists to their home country, but not the return of young anarchists, although they are just as dangerous. This is probably because it is very much easier to manipulate the latter and recycle them into the next chapter of the imperialist adventures. In June 2015, the Peoples’ Democratic Party (HDP), a new political expression of the PKK, received abundant financial support and CIA supervision, when running against Recep Tayyip Erdoğan’s AKP. Suddenly, it broke through the 10% limit of votes it needed to enter the Grand National Assembly, and won 80 deputies. On 17 March 2016, the YPG proclaimed the autonomy of « Rojava », which is the strip of land linking the area of Iraqi Kurdistan to the Mediterranean, along the Syro-Turkish border, but only on the Syrian side. « Rojava » therfore partially includes the zone of Idleb, which is currently occupied by Al-Qaïda. Since this state has been proclaimed by people who were not born there to the detriment of those who were, it is a colonial project, comparable to Israël, self-proclaimed in Palestine by Jews who had bought land there. The denomination « Rojava » was chosen in order to distinguish the territory from « Kurdistan » which is in Turkey, where it was proclaimed in 1920 by the Sèvres Conference . At the moment when the Emirate of Al-Qaïda in Idleb and the Caliphate of Daesh in Rakka are shrinking rapidly, NATO is pursuing its plan for the dislocation of the Syrian Arab Republic, and intends to create the « Rojava » of Kameshli. 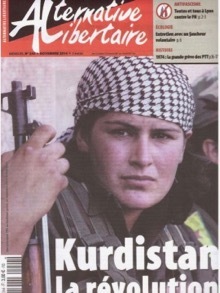 The Western Press gazes hypnotised at this « Rojava », draped with all the fashionable virtues – pacifist, egalitarian, feminist, ecologist, favourable to gender construction, etc. . It doesn’t matter that the YPG is in fact an army. It doesn’t matter that it is fighting the historic inhabitants of the North of Syria, the Arabs and the Assyrians, because on paper, it has created the Democratic Forces with them. The programmes of the Syrian YPG and the Turkish HDP are in line with US military strategy. Since 2001, the Pentagon has been planning for the medium-term « remodeling of the Greater Middle East », in other words, the division of large States into small homogenous States incapable of resistance. In the longer term, it is planning to oppose them, one against the other, until it has battered the region into a state of primeval chaos. « Rojava » was not proclaimed as an independent State because, according to the new Öcalan, any nation-State is evil in itself. According to NATO, it is simply an autonomous State which will have to join other autonomous states such as those which will take the place of the nation-State of Syria once it has been overthrown. According to the presently most important theorist of « municipalism », the American Murray Bookchin, in order to function as a democracy, the libertarian communities must be homogenous. That is why the « pacifist » YPG is currently proceding with the ethnic cleansing of « Rojava ».